I would like to wish all my readers and followers a Happy New Year and that it be be full of joy and wonderful creative endeavours. It is swelteringly hot here and the exodus to the beaches has already started as Christmas is when most kiwis take their annual holidays. For my virtual Christmas card I have painted the New Zealand Christmas tree - Pohutukawa. It is festooned with gorgeous red flowers during December and January. 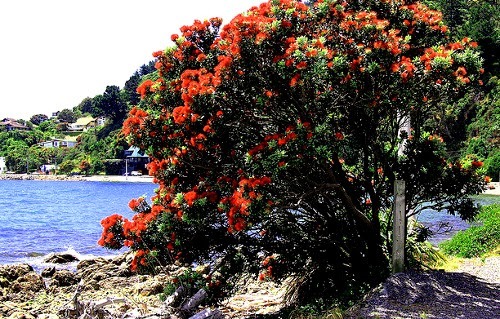 It is a coastal tree and adorns the beaches and sea cliffs - a wonderful sight. Gorgeous painting and tree!! Joyous Christmas to you my dear! 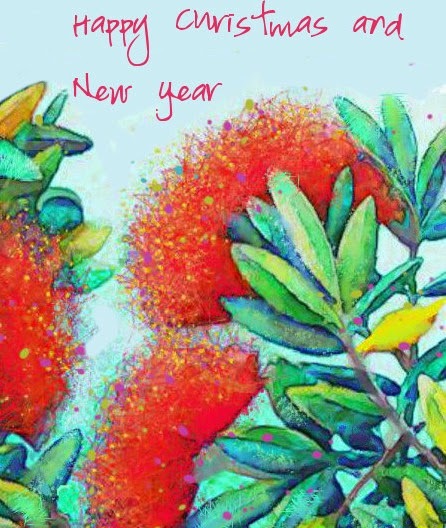 May your New Year be filled with an abundance of good health, wealth and joy! Thinking of you with love in this glorious season! What a lovely representation of the Pohutukawa, so lovely and soft and with the lovely greens and blues of the leaves. I like the purple splashes too. It gives the impression of sun and heat. Merry Christmas and a Happy New Year Sharon! Looking forward to seeing more of your pretty art! With best wishes and greetings for the Christmas season! Your New Zealand Christmas tree looks beautiful! I love all these happy colors!